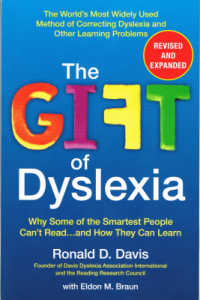 First published in 1994, Ron Davis’ The Gift of Dyslexia became an immediate best-seller and changed the face of how dyslexia is viewed – and how it can be remedied – worldwide. The third revised and expanded edition published in 2010 contains added information to help with the mental techniques for orientation and attention focus that are the hallmark of the Davis program. My son is 8 years and find it difficult to write, read and pronounce words. At school the teachers does not pay attention to him, so I started teaching him by myself which I can see the improvement. But can I take him back to school to associate with other kids or should I continue with him at home? Again please how can I get the Davis learners kit or the book? The book is available from many sources — if you click the “Bookfinder” link it will lead you to a list that you can modify based on your location. Our kits can be purchased at https://shop.dyslexia.com/ I would recommend reading the book first as international shipping costs for the kit can be quite costly. You may decide that the book gives you enough information to get started, and that you can purchase support materials such as modeling clay for lower cost locally. Its interesting we don’t call lefties disabled or diseased, but we do so with dyslexia. In my opinion the two are very similar and I think in the past when lefties were forced to use right handed implements they were driven to develop disabilities in a similar way. Both me and my daughter are dyslexic and we are both successful and have musical talents. I use very different parenting techniques and taught my daughter to read proficiently using very creative techniques. The parenting and the techniques are just not developed enough yet to reach other dyslexics thought I am glad progress is being made. I am so very grateful to know that Ronald Davis and Elden Braun published this book, suggesting that there are often very smart people who cannot learn the way most of us learn. I just learned that a good young adult man I know has dyslexia. I strongly believe that dyslexic people CAN learn if something is presented in a way they can learn. I taught high school chemistry and taught my students with many different modes. I used song, dance or physical movement to teach my students. In balancing equations, we used beans dyed with food color, so that students could “get” balancing equations. In solving the gas law equations, I had them physically move little cards with variable symbols on them, so they could solve PV=nRT easily by physically moving the cards diagonally across the equal sign. Without having read the Davis book yet, I am certain that there is a way to help dyslexic people. I am so happy to find this book. I want to help my friend, and I’m sure that using this book, I can. I am 20 and I read like an 8/9 year old. My spelling is horrible. I have given up on actual reading and I listen to everything. Audio books and a USB flash drive with synthetic speech programs is how I go true life. A lot of people have given help to me, to get me to the level I am on today. I have never heard of this program and so have the people that I askt. This program sound like a fairytale and I know that the world does not word that way. Can someone convince me that this is not just a fairytale? that this not only works on ‘some’ people? And please, don’t be afraid to come up with facts and to refer to scientific research. I will understand !! I live in the south of the Nederland’s and Belgium is close by. Is there a local center whare I can ask my question. I would suggest that you use the map or navigation links to find a Facilitator near you. Ask the facilitator to provide references of other adult clients they have worked with. You will be able to tell from each listing how long that facilitator has been licensed. All facilitators are fully qualified to provide Davis programs because of the rigorous practical training requirements, but the more experienced facilitators will likely have more references to provide, simply because they will have worked with more clients over the years. Adults tend to do very well with the Davis program because of higher levels of motivation and maturity. It is important to follow through with the program, using the tools you are provided after your week with the facilitator. How do I get a copy of your book/Kit? Because of the high cost for international shipping of the kit, we recommend that you start with only the book. The book will give you enough information to understand the program and to decide whether you also want the kit. We are happy to ship internationally from our store at https://shop.dyslexia.com/ — but shipping costs and delivery options can be variable in different parts of the world. Dyslexia is not a disease. It is simply a different way of thinking and learning. The problems can be corrected; dyslexic children can become capable and confident readers and strong students. The book, The Gift of Dyslexia, describes and explains the methods we use – so a first step for a parent is to simply read the book. Good question! I’ve added links to the Audio CD set and to Audible.com above, to make that easier to find. My daughter was diagnosed as having dyslexia (issues with a slow processing speed) when she was 22 years old. She had created strategies to help herself at school and university. As a child and teenager she would spend hours and hours studying but didn’t receive the grades she should have, for the amount of time studying. Her dyslexia was masked because she is extremely intelligent. But the frustration came when she needed to sit an exam. She can now explain that for the first 15-20 minutes of an exam her brain would ‘freeze’. This had a great impact on her ability to complete exam papers. Due to the fact that we did not know she had this issue she did not receive the extra time in exams that she could have been given. Now at age 25 she is struggling to hold down a job as she struggles with time management and self confidence. I feel very sad that I didn’t know she had a slow processing speed which is a characteristic of dyslexia. I would love to help her reach her full potential, and have just heard about the Davis Dyslexia Correction methods. Having read and understood ‘Gift of Dyslexia’ I can see you may have created an incorrect diagnosis of how the mind of your daughter is working. I believe her mind is working very fast in an attempt to find a translation that is understood by her and is acceptable to others. She is not ‘slow processing’. Also, a negative attitude towards her way of translation will harm her. You, as a parent must view her responses and behaviour as positive progress. I have helped my four grandchildren to understand their own minds when they were at school. The authorities refused to cooperate by giving individual support to these children, so it’s up to you as a parent to positively guide your daughter even though she is 25 years old. Please support her. My daughter is dyslexic, she has trouble remembering words, blending sounds, writing, she transposes her letters and numbers, and she it only transposes the normal “b” and “d” letters, but she will write all her letters upside down, backwards, or sometimes both, and she also reads backwards. As a mother, there are times I feel as if I’m failing her as a parent because when we are doing homework (she is eager to learn and tries so hard to understand) she visibly shuts down in front of me. My daughter is 6 and in the first grade; however, the school system will not officially accept / test her for dyslexia until the second grade. I am ordering and having your book rushed to me so I can try to help her, but I see you also host workshops. And are there any tips that you can give me while I anxiously await your book? Nikole, as your daughter is only age 6, I would encourage you to consider purchasing a Davis Young Learner’s Kit. The book will give you an excellent overview of the Davis approach, but the instructions in the book are geared to parents working with children age 8 and above. The Young Learner’s kit provides the materials you need along with a manual which provides instructions geared to parents of children age 5-7. The Davis techniques will work well for younger children, but for younger kids the environment needs to be kept playful and things have to be taken more slowly. We list all workshops we offer at https://www.davistraining.info/ — for the most part workshops in the US take place at our California training facility. The book described on this page explains the key parts of the Davis program and provides specific instructions on how to implement the program at home. Ron Davis has often said that he wrote the book with the idea of a parent of a 9-year-old child in mind – so that really is the best and easiest place to start. I have a son who is 12 years still can’t talk or read or call me dad i have seek all the help i could require from the but all in vain,until last month a doctor told my son was suffering from dyslexia so that wasthe first time i was hearing that kind of disease please help. Samson, dyslexia is not a disease, but rather a difference in the way the child thinks and learns. Dyslexia may be tied to some verbal problems such as stuttering or mispronouncing or confusing words, but it does not affect a child’s ability to learn to talk. If your son cannot speak at age 12, then it is a cause other than dyslexia. It could be that your son is autistic, but you would need a proper diagnosis to determine that. Your son’s inability to read could be tied to dyslexia, but I think you need to first focus on his inability to speak.